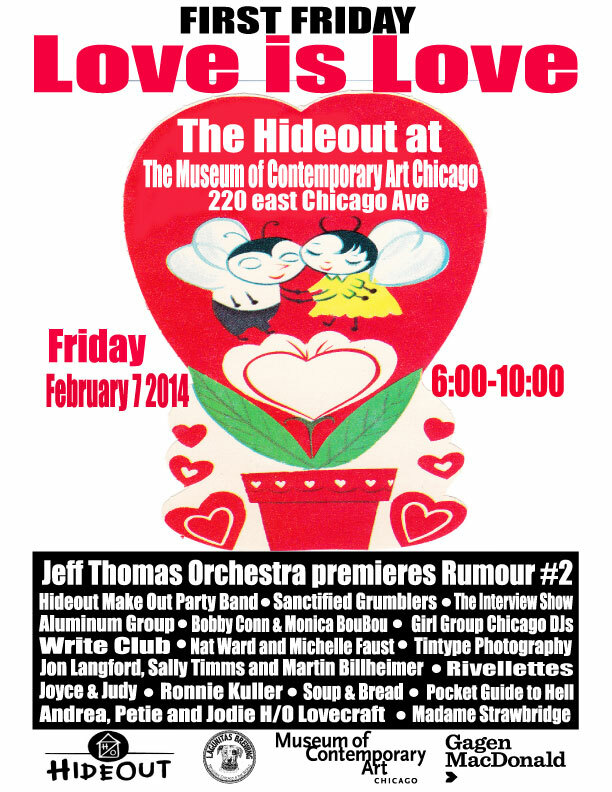 Join us February 7 when the Hideout takes over Chicago’s Museum of Contemporary Art for a night of love, madness, and soup. Titled “Love is Love” the whole shebang is part of the MCA’s monthly “First Fridays” series of public mixers, and features a full complement of Hideout regulars (see above) performing/making trouble around the museum. And in the restaurant? Soup & Bread, of course. From 6 pm till the crocks are empty we’ll be serving soup donated by the Drake Hotel, Old Town Pub, Fleming’s Steakhouse, the Goddess and Grocer, Chicago Marriott Downtown, Blue Door Farm Stand, and Mana Food Bar, along with bread provided by our friends at Publican Quality Meats and Crumb Bread. Pay-what-you-can-donations at the soup table all go to benefit the Chicago Help Initiative. So, come out, come out! Once the soup runs dry there’ll be plenty more to dip into, including love-addled appearances by Jon Langford and Sally Timms, the Aluminum Group, Ronnie Kuller, and the Hideout Makeout Party Band; special MCA installments of Write Club and the Interview Show; and the world premiere of Hideout bartender and composer extraordinaire Jeff Thomas’s new symphony Rumor #2. It all happens Friday, February 7 at the MCA, 220 E. Chicago. Admission to the whole event is $10 for MCA members, $14 in advance, and $18 at the door.